Jan 12, 2018 ~ Brazos Bend State Park has had some hard times the last few years with frequent closures due to flooding. We made a quick trip this week and things are looking good. We packed up the cart and decided to concentrate on the smaller birds at 40-acre Lake. As it was overcast we only took our Nikon rigs since they perform better in low light. That meant we were after the little guys with 500mm and 600mm long lenses - great for detail but tricky to hand-hold. Tripods are great if your subjects are stationary but challenging if they are constantly on the move. There are plenty of Swamp Sparrows hopping along the underbrush but the trick is to isolate one of the little guys for a clear shot. Waiting them out is difficult since there are bugs and food everywhere and they don't have to come in closer. Mostly you just stare at the brush and look for movement. This is the clearest shot I got all day and I didn't notice he has just eaten a spider? long-legged insect? until I got home and looked at it on the computer. I remember he came into a clearing and I was standing on my toes with the lens pointing down at him. No time to change the height of the tripod legs or the settings and then he was ... gone. This was a fun catch. She did not come any closer and this is a fairly large crop. 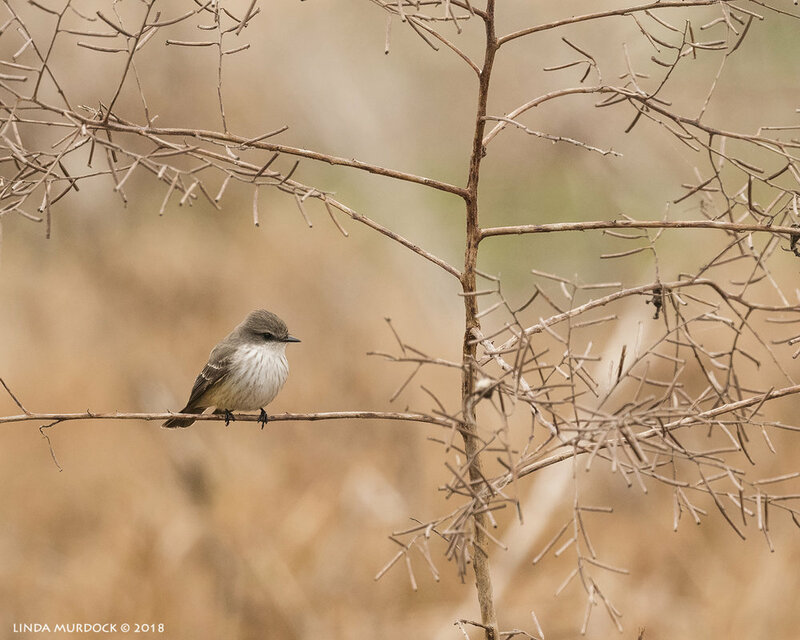 I watched her fly out and return but I could tell even at that distance it wasn't a Phoebe and was too small to be a Kingbird. Bill suggested female Vermilion Flycatcher and I think he is right. We got ONE quick glimpse of a male flashing bright red as he sailed across 40-acre Lake. In between stalking the bitty birds, we noticed the Double-crested Cormorants were busy showing off. Several were resting in the bare trees at the end of the island. And two BIG alligators were also out there on the bank under the trees. I hope the couple we met from Minnesota saw them. There were flocks of White Ibis feeding in the swampy area along the east side of the trail south of the Observation Tower. That area has been flooded for a couple of years now and you can see a lot of dead trees. We will have to wait a few more months to see what might leaf out again. There was a small group of Pied-billed Grebes fairly close to shore. We set up with our tripods and crates to watch. There had been showers earlier but by this time it was a wonderful bright overcast day. The grebes were actively diving and one came up with a big fish, but he immediately swam away from the group and us. Bill did get a clear shot of one with the huge fish, but all I got was the back of his head. Another grebe followed the lucky one and there were challenges and scuffles that we could watch through our camera lenses, but too far away to capture. At least for me. 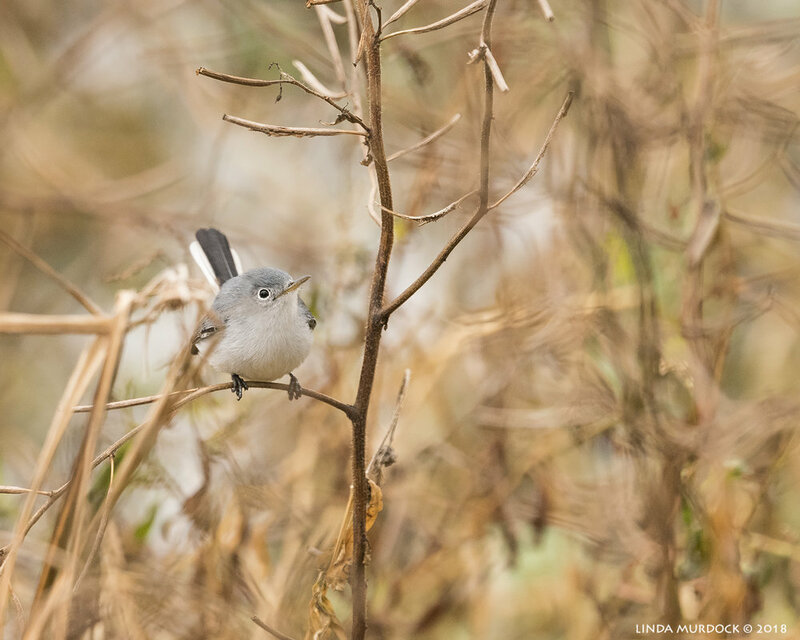 The Blue-gray Gnatcatcher was on my list for bitty birds, and we saw several but they were always buried in the brush or high overhead in the bare branches. Finally, we found this one in an open spot. I got off five shots before he disappeared and this is the best one even though it is partially blocked by reeds. Bill was to my left and his auto-focus grabbed the foliage in front and he didn't get a single shot. I consoled him with the fact he got the grebe-with-big-fish shot and I didn't. Walking back from the Observation Tower to the parking lot for 40-acre Lake I was looking at all the fallen and dead trees along both sides from the flood. Those trees provided shade for us and resources for the birds. The park is going to look quite different this Spring. Which is not really far away. We have been several times since it reopened and I am encouraged by the open water we found at 40-acre Lake. We saw one Bittern, a sleeping Black-crowned Night Heron, some Common Yellow-throats, and a lot more flitty-kinglet sized birds. Butter-butts. A few Blue-winged Teals and Little Blue Herons. Great Egrets and Anhingas. A Coopers Hawk. It was a pretty birdy day. Have you been to Brazos Bend lately? And did you get a better photo of the Blue-gray Gnatcatcher than I did? Let me know in the comments below.